The Rainsport 3 sports Uniroyal’s innovative Shark Skin Technology to help with the suppression of water turbulence on the groove surface. 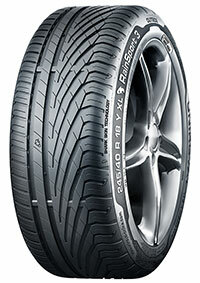 This ensures that water is channelled more quickly out of the longitudinal grooves included in the tread design. The flow-optimised pattern structure enhances fast water displacement meaning greater protection against aquaplaning. Its flow-optimised asymmetrical pattern is non-directional but combines the advantages of asymmetrical and directional concepts in tread design.